Recombinant fragment within Human GTF3C4 (internal sequence). The exact sequence is proprietary. WB: U-87 MG whole cell lysate. 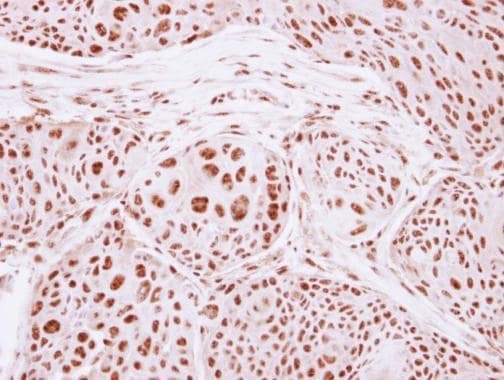 IHC-P: Human breast cancer tissue. 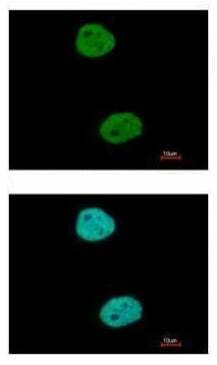 ICC/IF: HeLa cells. Our Abpromise guarantee covers the use of ab229113 in the following tested applications. WB 1/500 - 1/3000. Predicted molecular weight: 92 kDa. Essential for RNA polymerase III to make a number of small nuclear and cytoplasmic RNAs, including 5S RNA, tRNA, and adenovirus-associated (VA) RNA of both cellular and viral origin. Has histone acetyltransferase activity (HAT) with unique specificity for free and nucleosomal H3. May cooperate with GTF3C5 in facilitating the recruitment of TFIIIB and RNA polymerase through direct interactions with BRF1, POLR3C and POLR3F. May be localized close to the A box. Belongs to the TFIIIC subunit 4 family. Paraffin-embedded human breast cancer tissue stained for GTF3C4 using ab229113 at 1/250 dilution in immunohistochemical analysis. Paraformaldehyde-fixed HeLa (human epithelial cell line from cervix adenocarcinoma) cells stained for GTF3C4 (green) using ab229113 at 1/500 dilution in ICC/IF. Nuclear counterstain: Hoechst 33342 (blue). ab229113 has not yet been referenced specifically in any publications. Publishing research using ab229113? Please let us know so that we can cite the reference in this datasheet. There are currently no Customer reviews or Questions for ab229113.